Why do you want to either buy or make clarified butter? Depending on your diet plain butter may not be what you can use because it contains traces of milk proteins, which may be a problem for people that have sensitive systems. To make this type of butter, you just take non salted butter and cube it, place it in a sauce pan and heat it on medium heat. Be patient and let the butter melt without string it. You will see foamy white dairy solids rise to the top surface. Take a spoon and skim the solids off the top and discard them. Remove as much as you can, this will leave you with clarified butter. Strain the butter through cheesecloth into a glass jar that you can store the butter in. Storage is good in the refrigerator for up to six months. Now if your short on time you can always go to your Trader Joe’s and pick up a container too. 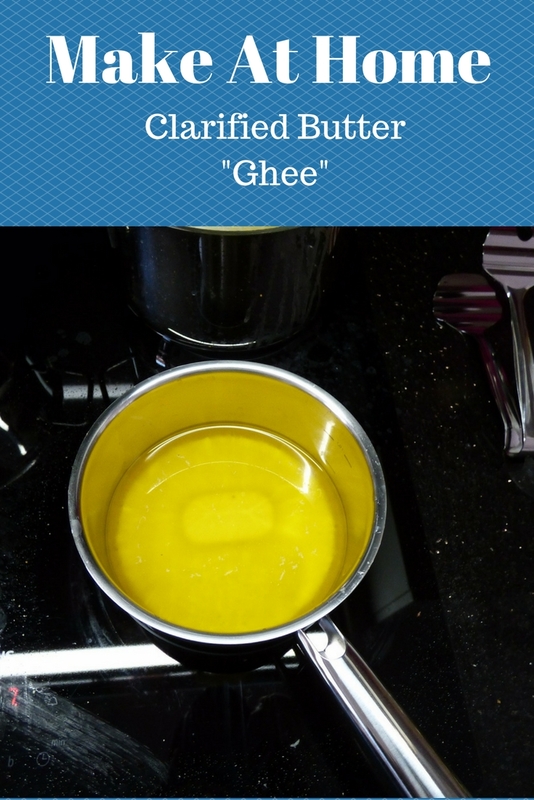 Now Ghee is made a little different, this method by cooking it longer and letting the milk proteins brown up and fall to the bottom, the flavor is a bit sweeter this way but in the end it all depends on how much work you have time to do. This is the type of butter that you will want to use on your shrimp and lobster tails. I like just buying my clarified butter, less mess and it saves me a lot of time.